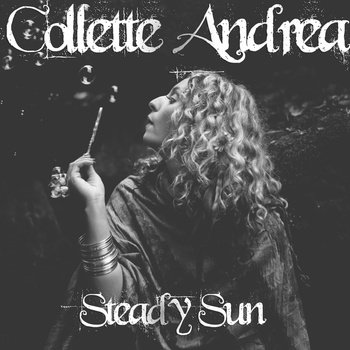 It was almost two years ago that Collette Andrea (Collette Falk) first made an impression with her debut, Luna. The Brampton songstress and former GTA-resident who has just recently moved to Hawaii has just released her long-awaited follow up, Steady Sun. For fans of Luna, there’s plenty of promise here as she reunites with Hannah-Kin Studio for another five-song EP that yet again showcases her rich vocals and ability to captivate through a simplistic touch. From the first notes of “Give Me All Your Lovin,’” Falk seems to be setting out to prove that she’s gained nothing but confidence in the two years since we’ve last heard from her. There’s an added edge to her voice as she sings, belting out the titular demand and reshaping the slow-moving country beat for her own indie blues twist. That sort of growth is evident throughout Steady Sun, from the hypnotically philosophical “A Song About Spring” to experimental “You and Me.” Along the way, Falk soulfully puzzles over time as her guitar chords roll through the pictured landscape and her lyrics thumb over unmet expectations. It’s on those slower, wandering songs like “Water” that her most impressive instrument—her voice—really steps out with the kind of presence that made certain tracks on Luna stand out for their potential. Typically an acoustic performer, Falk has maintained a stripped down approach to her instrumentation with a lone guitar offering up the only accompaniment she really needs. While her slower tracks may add the occasional flourish of backing vocals or ambiance that emphasizes the imagery, there’s a sense that Falk understands the balance she’s keen to strike. That’s not to say the entire album is a delicate acoustic journey as the last two songs on the EP strike out in a darker, more fevered direction. Eponymous “Steady Sun” marks the transition with a slow build up to a crashing shift a minute in. Falk’s vocals, typically clear and smooth take advantage of some effects to roughen them up as she aggressively pleads her case. While closer “You And Me” returns to Falk’s even-handed approach, there’s a divergence from her usual sound as she plays with more eastern sounds, layering them over background clatter to set a scene in a way her other tracks have only hinted at. Yet again Falk ends her album with the promise of more exploration in the future, expanding and delving into new ideas and sounds and seamlessly tying them into what has come before. And as her voice comes out stronger than ever, it’s certain that whatever direction she chooses to go in she won’t lose her most captivating sound.